BANGOR, Maine — In two calls Monday evening to the Bangor Daily News, Gov. Paul LePage vehemently disputed assertions made by a liberal blogger in a forthcoming book that LePage made references in 2013 to executing Maine’s speaker of the House and Senate president. Mike Tipping, communications director for the Maine People’s Alliance, has written a book about LePage titled “As Maine Went.” He has launched an online fundraising campaign to pay for the book, which has yet to be published. The first chapter of the book was published exclusively on the national political website Talking Points Memo on Monday morning. Tipping also summarized his chapter in a related blog post, which is hosted by the BDN. Tipping cited a recording of a Feb. 4, 2013 , radio program called the “Aroostook Watchmen.” During the recording, the show’s hosts, Steve Martin and Jack McCarthy, recall a recent meeting with the governor. The men say they talked with the governor about hanging being the punishment for high treason, which they believed Eves and Alfond had committed. The governor mentioned that he meets with many constituents and groups, from a variety of backgrounds. “I met with President Barack Obama, but I’m not a liberal,” LePage said. When asked about the governor’s denial, Tipping pointed out that Martin and McCarthy discussed the meeting during a radio show two days after it happened, while LePage’s version of events is coming more than a year later. “It’s just sad that the governor of our state would indulge in some of these conversations,” he said. LePage said he never has refused to meet with any group of people. Although he and Democratic legislative leaders had a dispute in 2013 in which the governor reportedly called off scheduled meetings, LePage claims that Eves and Alfond actually didn’t ask to meet with him until recently. He said the leaders recently asked to meet with him about the controversial Alexander Group report and he said he would meet if they agreed to talk about additional funding for Maine’s nursing homes. He said he hasn’t heard back from them. Tipping, who is actively supporting Democrat Mike Michaud in the governor’s race, said LePage has refused to meet with him. LePage also said there was no five-page memo from his legal counsel about the Sovereign Citizens, which Tipping linked to from his blog. When pressed further, the governor said he remembered the memo and the lawyers explained the process of remonstration, by which citizens can petition the government for redress of grievances. As for the Freedom of Access request, LePage said Tipping is welcome to his notes — Tipping said in his chapter that a previous request for the governor’s notes was denied — but that they are in shorthand and code that only means something to him. “That’s why I never use email,” he said. 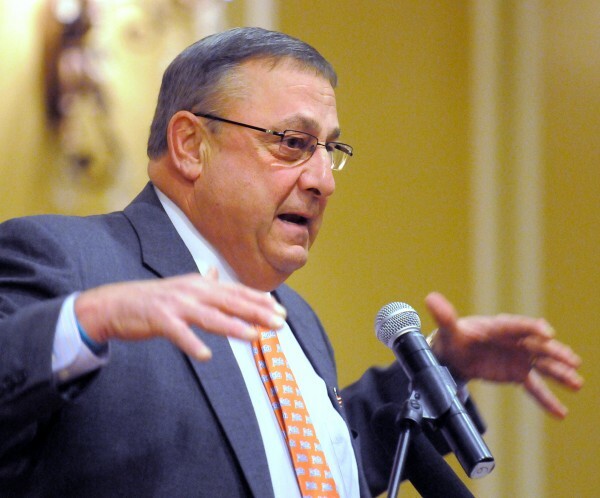 LePage also threatened to sue Tipping for publishing his book, as well as the Bangor Daily News. Sun Journal writer Scott Thistle contributed to this report.